If you just want to join our mailing list without any of the benefits below, please click here. You can only join the membership scheme at a hUJe party. 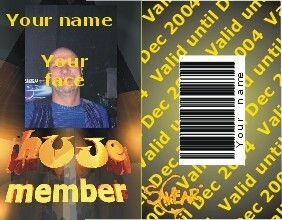 We take your picture to put on the card and take a note of your contact details as well as your birthday. During the following week we make your card to be picked up at the till from the next hUJe onwards. It costs £10 for a year's membership - you can pay a tenner on top when you join for a "hUJe member" ("comfort") T-shirt, and you're additionally entitled to order any of the other gear from our shop with the hUJe member logo on it.